37 years of studying one of the most iconic birds in the world, the Golden Eagle, has made Dave Walker a veritable expert. In this excerpt from his newly published book, the author acknowledges the ‘fascination, dedication and obsession’ that birdwatchers foster for this bird, while highlighting the need for objectively reviewing all aspects of Golden Eagle ecology in order to provide fuller understanding of this majestic but also misunderstood species. This field guide examines behaviour and its interpretation, and considers most aspects of Golden Eagle ecology as encountered in the field. In this way it also highlights the limitations of the received wisdom, the difficulty of reaching sound conclusions and the ways in which improvements might be made. Most of all, it serves to show that investigative fieldwork still has a role to play in ornithology, provided that the limitations of the available evidence are recognised and that observers record what they see, rather than what they think they are seeing. The golden eagle is one of the most iconic of British birds and has all the attributes likely to engender fascination, dedication and obsession in birdwatchers: it is large in size, rare in status, peerless in flight, occupies remote locations, and is controversial, secretive and seen to be a top predator. 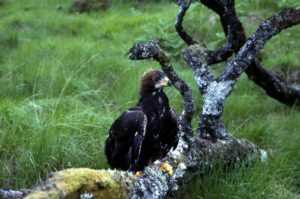 The species has long attracted dedicated watchers with at least twelve authors producing books based specifically on their experiences with golden eagles in the UK, while others, including members of the Scottish Raptor Study Groups (SRSG), go about the business of watching, recording and protecting eagles for their own enjoyment and for the future of the species. There have also been many scientific studies so there would appear to be a wealth of information, knowledge and experience available to anyone wishing to learn more about the species, take advice on its ecology, management and conservation and aid the everyday understanding of what is seen. Tree nests are not always in native pine or blocks of woodland. Being an intensively studied and well-known species, the received wisdom has come to represent the standard of knowledge used in management of the species and its conservation. It is also what is known about golden eagles in an everyday sense and the base against which observers compare and contrast their observations and reach conclusions. They might not know something from experience but they can make an acceptable interpretation on the basis of what has been seen elsewhere. Although this information is generally considered to be highly reliable, if not exhaustive, unfortunately for eagle conservation this is a popular rather than a realistic image. The golden eagle is actually not a well-known species and in his acclaimed monograph The Golden Eagle (1997 and 2010) Jeff Watson wrote that ‘little is known about golden eagle behaviour outside the breeding season’. 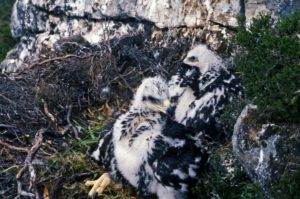 A review of that work includes words such as ‘meagre’, ‘poor’, ‘circumstantial’ and ‘unquantified’ used in relation to most aspects of golden eagle ecology. People tend not to see these comments because they believe that they do not apply to them or to their knowledge and experience. It is the failure to recognise these limitations that acts against competent species management, leads to decisions being based on assumptions rather than on evidence and allows unreliable guidance to be published and enacted. It can also lead to fieldworkers misinterpreting their observations. Two chicks showing no signs of sibling aggression; at about three weeks old, the sort parts are now yellowish in colour after being flesh-toned at first after hatching. The received wisdom has been compiled essentially from site monitoring, investigative fieldwork and scientific research, each of which has its own equally important limitations. This is not to dismiss the value of these pursuits, only to note that the limitations should be recognised for what they are. It is also not to claim or suggest that the direct results of fieldwork are always more reliable. 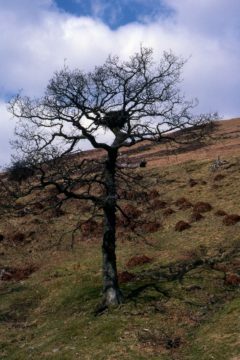 In fact, the obsession with nests means that most fieldwork has been conducted in a very old-fashioned manner and is of limited value to management. 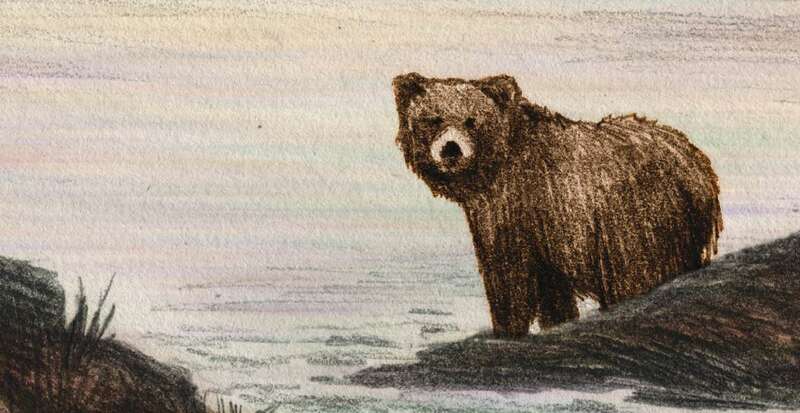 It is the controlling aspect of professional conservation that is probably of greatest concern because even sound contradictory field evidence can be too easily dismissed or classed as unrepresentative. While it is important to recognise that there is now a greater imperative for solid evidence to support species management, site-specific evidence is being passed over in favour of a more generic approach. These problems can only be addressed and our knowledge improved by questioning the quality of the received wisdom in a constructive manner, by collecting data without preconceived ideas or expectations, with proof or the recognition of uncertainty – beginning at a very fundamental level. Contrary to popular belief, the golden eagle is not a predator, but a hunter-gatherer; it kills some of the food it eats but it also feeds extensively on dead animals and, on some occasions, on animals that have been killed by other species. 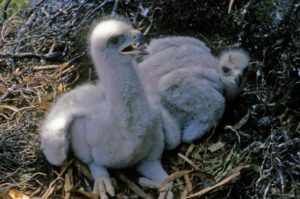 Nestlings at about seven weeks old; the soft parts are now brightly yellow. The golden eagle does not readily lend itself to generalisations. No two eagle territories will be the same in any way; no two pairs will behave or use their territories in the same way; no two single eagles will spend their immature years in the same way; no two observers will have the same experiences; and no repeat scientific research projects will produce the same results. In this book the author brings to bear decades of work with the species to review all aspects of golden eagle ecology and provide a better understanding of what fieldworkers and birdwatchers are likely to encounter aided by a month-by-month review of activity of all classes of this majestic bird. Recently-fledged juveniles spend lengthy periods perched on the ground or on low perches waiting for food to be delivered. 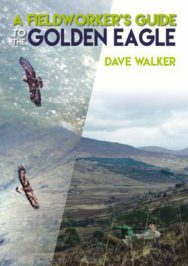 A Fieldworker’s Guide to the Golden Eagle by Dave Walker is out now published by Whittles Publishing priced £19.99.